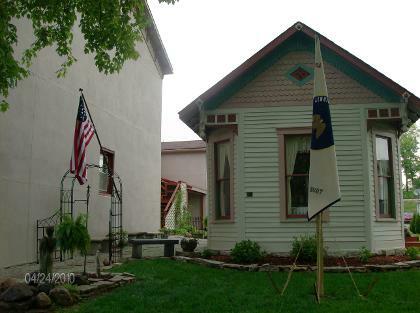 Terry Furgason and Tom Rice in the Victorian house. Rick and Nancy Apsley pose for the camera. Greys' Headquarters with flags displayed. 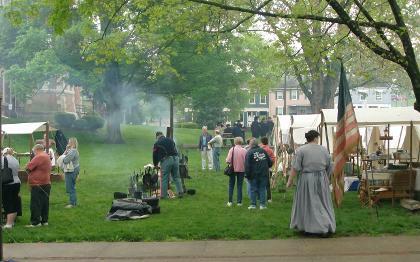 A view of Union camp from the Victorian house. 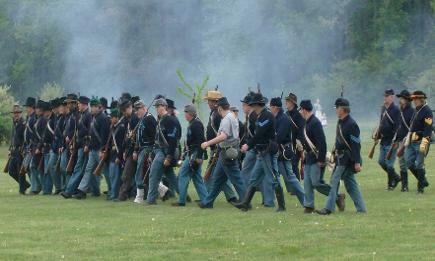 The Union forces advance onto the battlefield. Terry (R ) joins the 11th and 6th Indiana. Terry (in back) takes a "hit" during the battle. 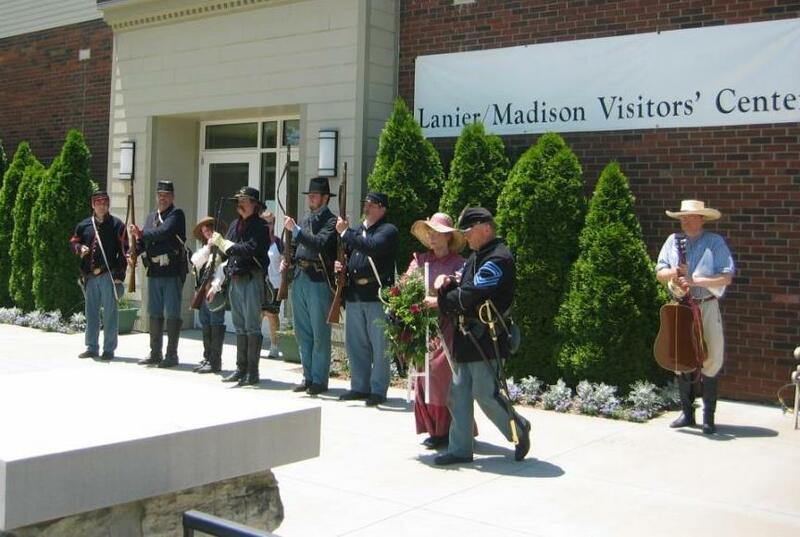 Terry Furgason (6th from L) and Union soldiers perform ceremony honoring CW soldiers. 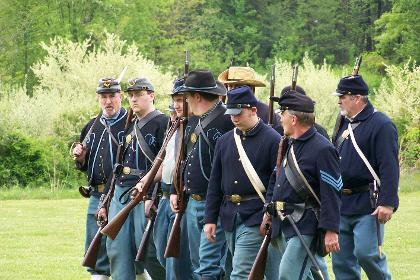 Mike Ochs (3rd left), Terry (6th left) and Rick (7th left) form ranks after the battle. Connie Ochs, Mike, Rick, Terry, & Jan Furgason pose for a picture after the Saturday battle. Rick, Mike, Connie, & Jan relax after the battle with some fruit and desserts and lots of cold water. Union camp of 6th Indiana infantry and 4th Indiana Cavalry with Greys tent on right. Nancy Apsley, Rick Apsley, Terry Furgason, & Mike Ochs pose before the Battle of Corydon. 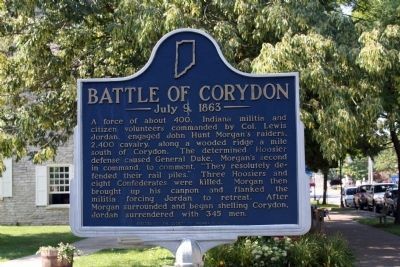 Civilian & militia forces form a skirmish line against Morgan's men prior to the Battle of Corydon. Furgason, Ochs, & Apsley (center) ready for skirmish. Jan Furgason (R) & Connie Ochs look over goods. Mike Ochs checks out the display of the Spencer rifle. Terry & Jan pose in front of the Greys' tent while Mike & Connie discuss the 1860 Henry rifle..
Ochs (L) & Furgason (R) share a joke with Alan Weiss & Ed Noel of the 32nd. Furgason and Ochs prepare to fire during the skirmish. 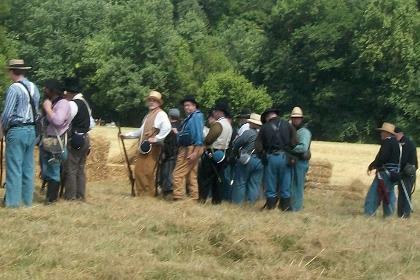 After the skirmish, the reenactors talk to the crowd. Mike (R) and Ed Noel (32nd IN) put on a skit. 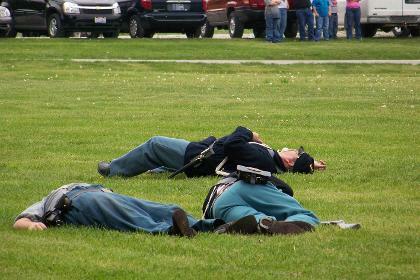 US and German WW II reenactors camp. 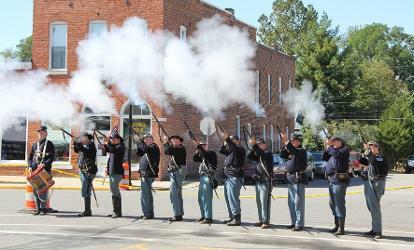 Mike helps to explain to the crowd the Henry rifle and its function during the Civil War during Hope 2010. 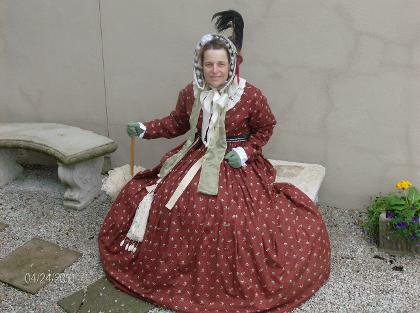 Musician Shawn Bentz of the 11th Indiana tells how the drum and bugle were used during the Civil War as the rest watch.